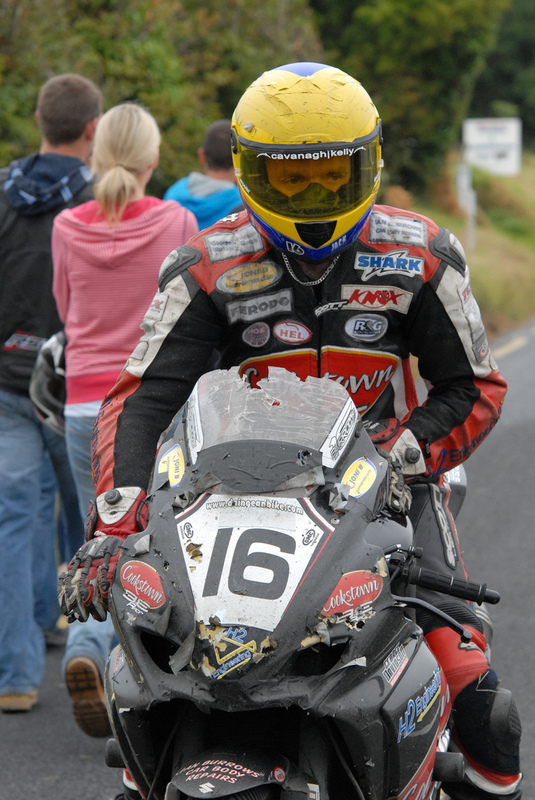 Contributed by Aidan Lynam, Road racing, an Irish phenomenon is the first in a series of occasional articles by contributors from the wider motorcycling community. Aidan is a freelance race journo/road tester, supplying copy to both Road Racing Ireland and Bike Buyers Guide magazines. You can follow him on Twitter at @Aidan34. Before I start I must warn the reader that the running order below is not a guaranteed or confirmed running order, races regularly swap dates from year to year and quite often different circuits are also used. Make sure to check the up to date lists before making travel plans, most clubs have websites and/or Facebook pages to keep fans updated. Also worth remembering is that in Northern Ireland race day is always on a Saturday whereas in the South races are held on Sunday, with the exception of the Skerries 100 which are held on a Saturday. Practice takes place on the day preceding race day. 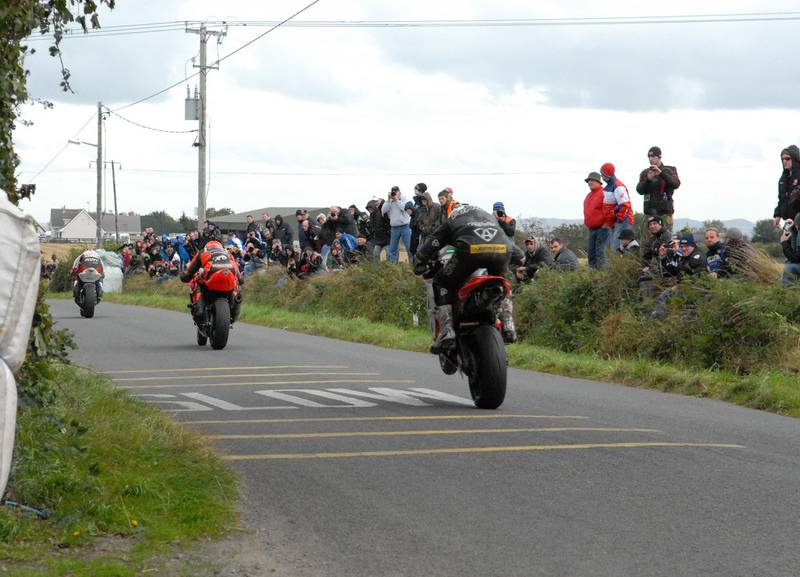 Around the world the term ‘road racing’ tends to mean ‘short circuit racing’ as opposed to ‘off-roading’ but in Ireland we take things literally and as such it means racing between the hedgerows surrounding, and very often lining the streets of small towns such as Skerries, Clough, Walderstown, Crossakiel, Armoy and Dunmanway. 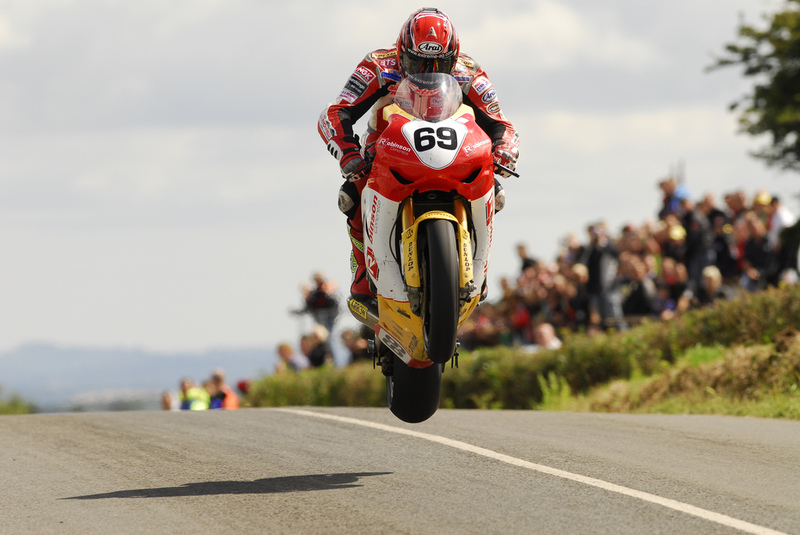 Although we like to think of ‘road racing’ as exclusively Irish, there are thriving races in New Zealand, Holland, Spain, Germany and the Czech Republic as well as the iconic TT and Manx races held every year on the Isle of Man. 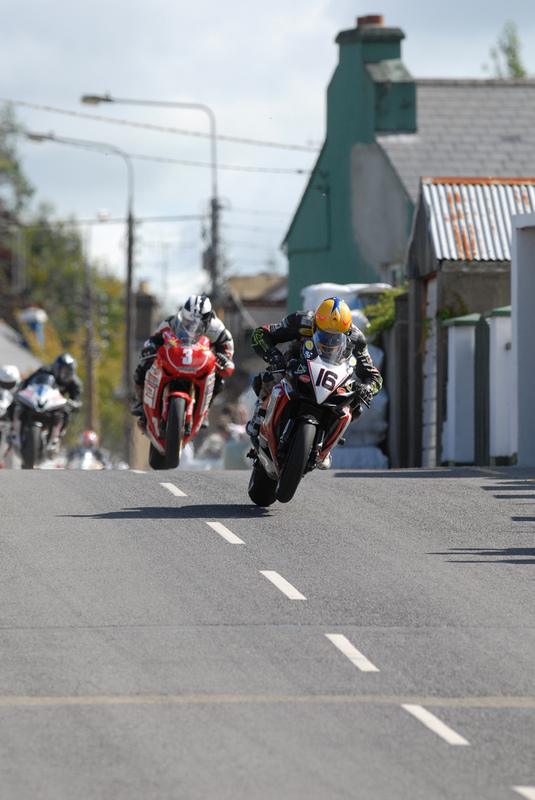 However due to a lack of short circuits in Ireland and the fact that the powers that be took a more lenient view on the sport here, whilst ‘pure road racing’ died out across Europe, it positively thrived on our wee island. It’s hard to put into words exactly what road racing means to a fan, I’m sure it means different things to different people but the sheer proximity of the fans to the heart of the action is hard to replicate in any other sport. Where else can you have a Superbike pass within inches of you at close to 200mph? Where else would a marshal ask you to lift your feet into the hedgerow so they don’t get hit by a passing bike? Where else can you sit in the garden of a police station as the bikes whizz around the garden wall while you have a cup of tea? “Only in Ireland” as the old saying goes and I can only imagine what the health and safety people behind Moto GP would make of it all! 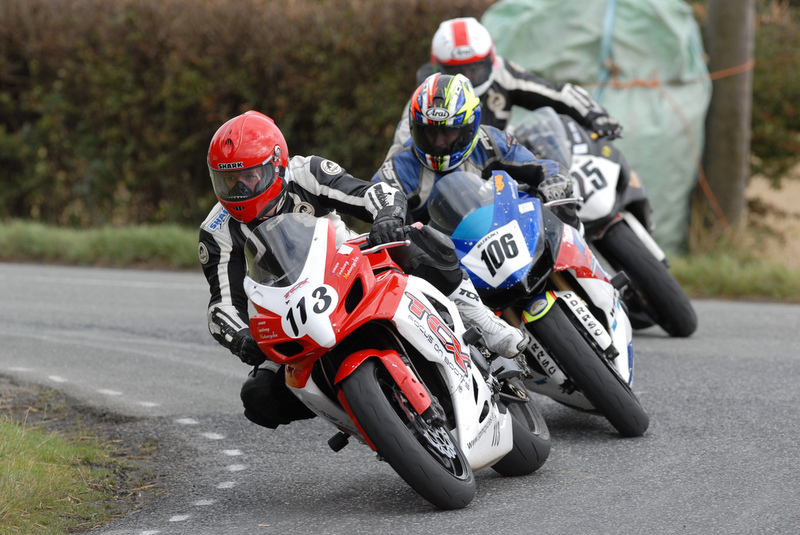 The road racing calendar traditionally kicks off in April with the Cookstown 100 in County Tyrone, which gives the riders and teams a chance to shake down their machinery after the winter break. Very often the TAS (currently Tyco Suzuki) squad attend this meeting giving the National riders some added competition. The Cookstown 100 has run on many different circuits over the years but currently is situated on the Orritor Road circuit. 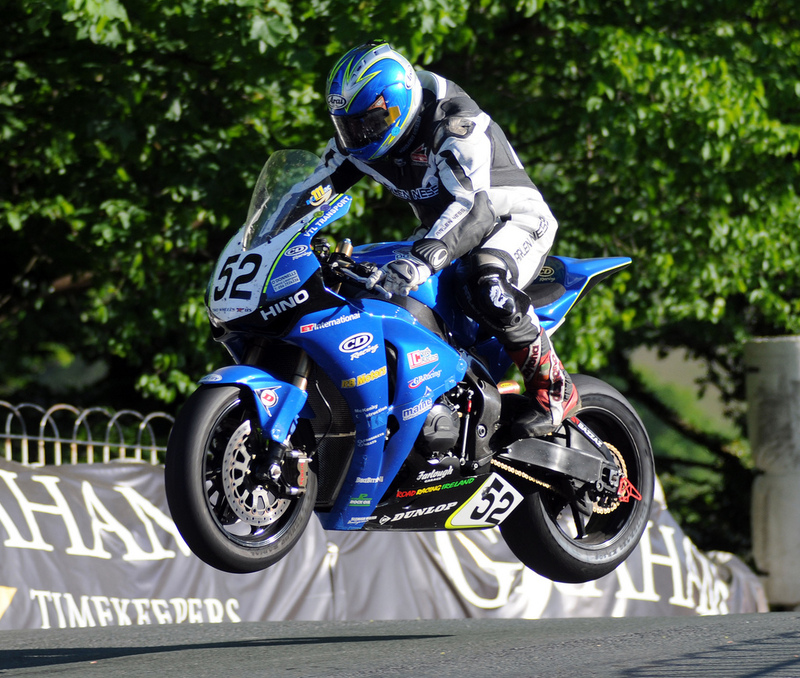 A fast circuit that offers good viewing spots for the spectators including the famous jump at Black’s Farm; or you can enjoy a pint while watching the action in the Braeside Inn. 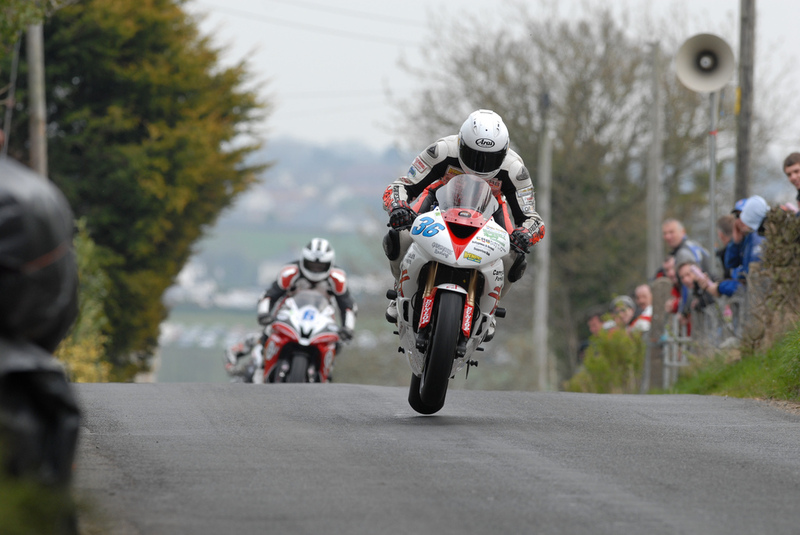 The second meeting of the year see’s the competitors and fans heading to Tandragee in Armagh in early May. Many riders claim this one as a favourite due to the tight and technical nature of the circuit; it also has the ‘almost’ obligatory jump or two thrown in for good measure. 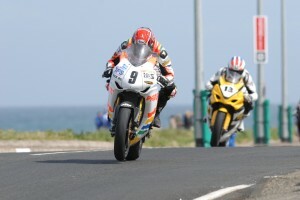 The first ‘International’ road race of the year is the North West 200 which also takes place in May. 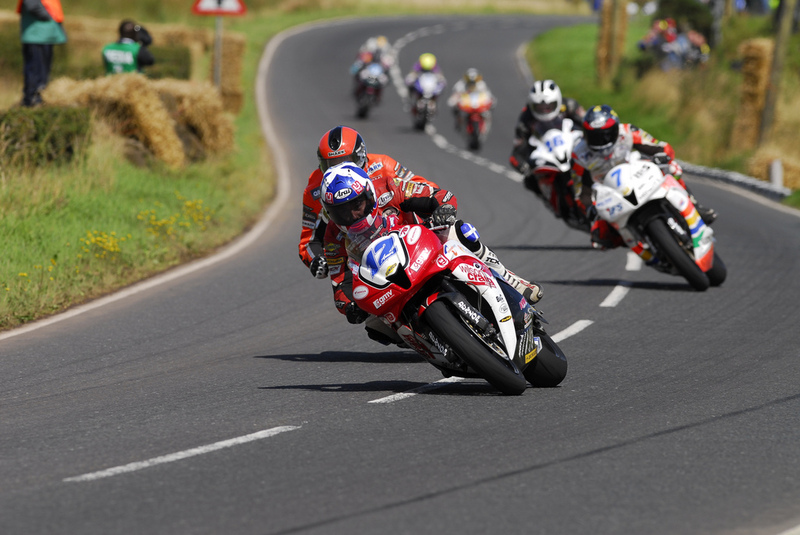 The North West 200 is held on a high speed triangular circuit linking the towns of Portrush, Portstewart and Coleraine and attracts crowds that other ‘mainstream’ sports can only dream of. Often referred to as ‘almost’ like a short circuit, the high speeds and ‘furniture’ that surrounds the circuit says otherwise! 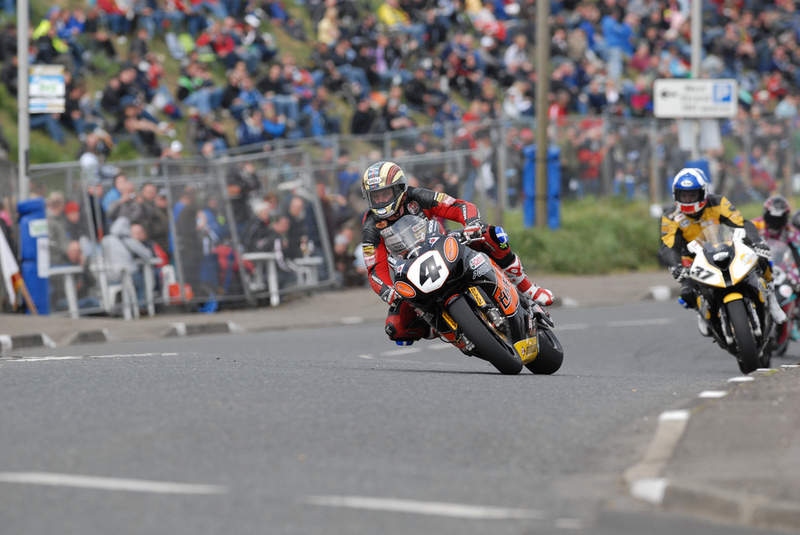 Like any other ‘roads’ circuit, the NW200 is one that demands respect and is not for the faint hearted. 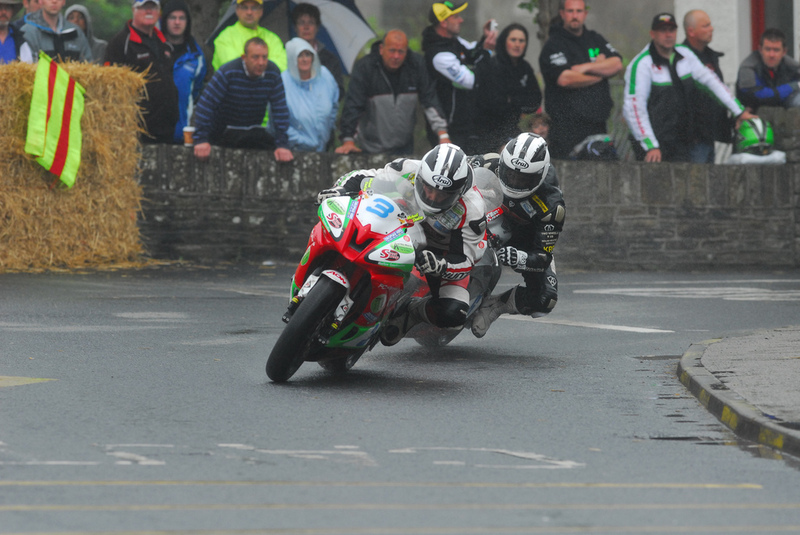 Viewing spots are available throughout the length of the circuit with favourites being the Ballysally (Magic) Roundabout, Metropole, Church and York Corners. The Irish scene takes a well-earned break during late May and early June as road racing fans from all around the world make their way to the Mecca of motorcycling, the Isle of Man, for TT fortnight. The Isle of Man is a paradox that doesn’t truly sit comfortably within itself; for four weeks (two for the TT races and two for the Manx GP) the island echo’s to the sound of mechanical mayhem as riders pit themselves and their machines against the toughest, and very often the cruellest, circuit in the world, yet for the other 48 weeks of the year you would scarcely believe that such high speed antics would be tolerated in such a quiet back water. With the circuit being more than 37 miles in length, viewing spots are many and each fan will have their own favourites, many with indelible memories of bygone races attached. Once the TT is over, it’s straight back to the National scene with the Bush Races in County Tyrone. Part of the circuit runs through the village of Bush with the rest of it running through hedge lined and narrow back roads. The ‘Bush’ races are record breaker Ryan Farquhar’s home races but sadly due to his recent retirement from competition, the fans won’t see ‘Flyin Ryan’ continue his winning ways, however as he will continue as a team owner, the bright orange KMR Kawasaki’s will no doubt be near the front of the pack for many a race day yet. The first race of the year in Southern Ireland is usually the Skerries 100 which is held in North County Dublin. In years gone by the bikes actually ran through the village of Skerries but nowadays the track uses narrow, and in places entirely, tree-shaded lanes to the north of the village. So narrow is the circuit in places that it has earned itself the nickname of ‘Scaries’ and if viewing at ‘Dukes Bends’ it is wise to adhere to the marshal when they tell you to mind your feet as the bikes literally brush the bank beneath you as they pass. The club have fitted temporary grandstands around the circuit in the past few years, so although spectators have been moved from some of their old haunts, the raised platforms give excellent vantage spots overlooking ‘Ghillie’s Leap’ and ‘Finnegan’s Corner’ whilst the rest of the circuit retains the more traditional viewing points. 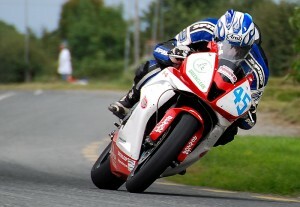 After Skerries it’s off to Westmeath for the ‘Race of the South’ in Walderstown. Run by the club who formerly ran the races in Fore Village, the Walderstown Circuit has the honour of having a Garda station as one of its corners (albeit now a retired station). The old Fore Circuit was famous for having the ruined Abbey as a backdrop as well as having the racers pass the door of the legendary pub in the village ‘The Seven Wonders’ (Google the Seven Wonders or pay the village a visit, it’s worth it just to read the signs). The ‘new’ circuit has a fast main straight but the rest is tight and twisty country lanes, surrounded by tall hedgerows and ancient trees. The club are well known for their time-keeping so this is one race not to show up late for. Although the Kells Club held no races in 2012 due to financial constraints, it looks like the club will be back in action for 2013 and it also looks like they will be back on the very popular ‘Crossakiel’ circuit, which is about 10km outside the town of Kells. 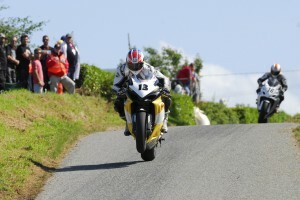 A firm favourite with riders and fans alike, the Crossakiel circuit features some of the biggest and most spectacular jumps in road racing, namely the imaginatively titled ‘The Jumps’ which are on the back straight and ‘Hanlon’s Leap’ which is just around the corner from the start/finish line. 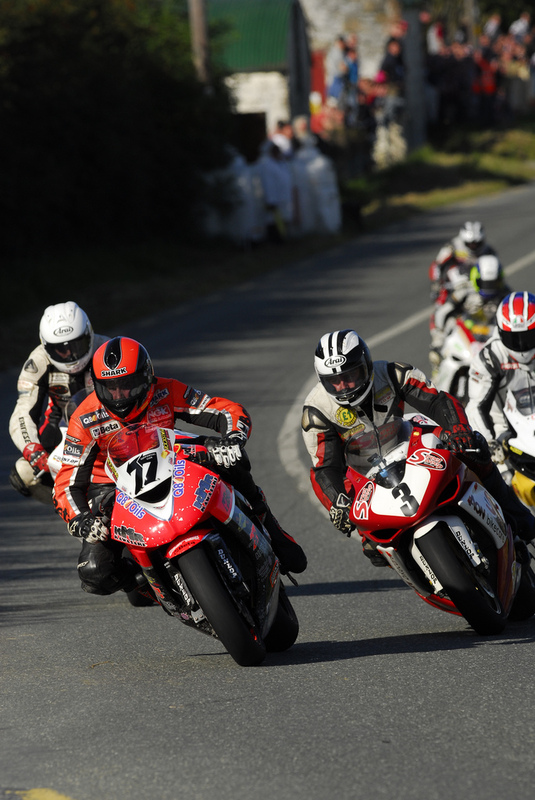 Armoy in County Antrim plays host to the ‘Race of Legends’, so named as the legendary ‘Armoy Armada’ was formed here. The ‘Armada’ was made up of such household names as Joey & Jim Dunlop, Frank Kennedy and Mervyn Robinson, all road racing icons in their own right but sadly only Jim Dunlop remains alive of the quartet. Those that have seen the old documentary ‘The Road Racers’ will remember seeing Kennedy fettling his machinery in a small workshop in the village, the building still stands today but it is now a small chapel. The course itself is blindingly fast in places yet tight and technical in others with a pair of jumps thrown in for good measure, one of which has the racers actually turning a corner in mid-air! Viewing points are ten a penny throughout the length of the circuit with raised areas giving excellent viewing spots to the public, one of which overlooks the ruins of an ancient round tower. The Mid-Antrim 150 has been held on a course surrounding the village of Clough since 1989 with the start/finish line in the village itself. The course is over 3 ½ miles in length and of course has its fair share of bumps and jumps but it also features a hair pin bend that goes around the outside of a church where the resident zone marshal gets to sit in a strategically placed bench, a throne worth suffering the publics (occasional) wrath for I dare say! 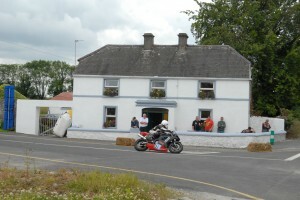 Like the Kells Club, the Athea Club took a sabbatical in 2012 but they have sought, and been granted, a date for 2013 so the tiny village in County Limerick will once more echo to the sound of Superbikes. Due to the remote nature of the circuit, and indeed the village, something of a festival (or possibly siege) mentality seems to take over the village on race weekend and the ‘Craic’ is to be had in any of the small hostelries that line the main street, although a pint in Sean Mac’s has to be experienced! There are viewing spots aplenty around the circuit but the favourites seem to be on the hill that leads back into the village and along both sides of the main straight on raised embankments. Three club’s that haven’t applied for a date for the past number of years are the Faugheen , Dundalk and Monaghan Clubs and sadly it’s not looking likely that any of them will in the near future. The Faugheen circuit was one I enjoyed due to the ‘middle of nowhere’ atmosphere that permeated from the small village in County Tipperary over race weekend. The club still run off-road events so who knows what the future holds. The Dundalk Club struggled in its latter years to find a home with various circuits tried, but none held a viable long-term future for a variety of reasons, but no one will ever forget the monster jumps of the Darver Circuit. The Glaslough Circuit in Monaghan was one that I dare say fans held in higher esteem than the competitors did. It delivered spectacular racing in its day but the surface was often likened to a Moto-X venue in its latter years due to the amount of bumps and jumps and the deteriorating surface. However, every road racing fan that ever attended a race in Glaslough will have lifelong memories of the golden era of two-stroke racing. 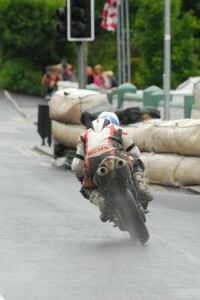 2 stroke action at Faugheen. Early August see’s the Ulster Grand Prix ‘Bike Week’ which also includes the Dundrod 150 races. The circuit is 7 miles in length and sits in the hills overlooking Belfast. A frighteningly fast circuit that claims the title of ‘The World’s Fastest Road Race’ with Manxman Conor Cummins currently holding the fastest lap record of 133.284mph! A ‘riders’ circuit if ever there was one, the Dundrod Circuit has fast sweepers, first gear hairpins and ridiculously fast straights, not to mention the variety of cambers or the elevation changes, think Portimao with telegraph poles, trees and houses and you are starting to get the picture! 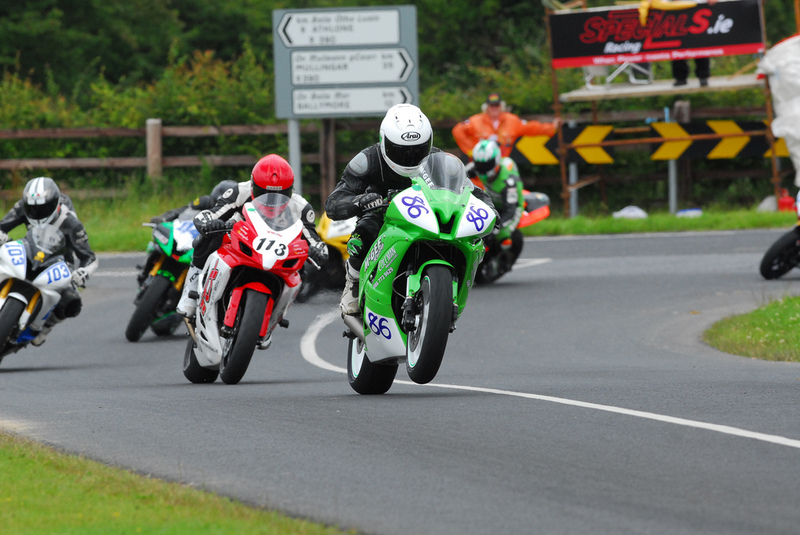 The Dundrod 150 races take place on the Thursday of race week with the UGP races being held on the Saturday. Also held in August is the Manx Grand Prix which has now been renamed the Manx Grand Prix Festival for 2013. The Festival will, for the first time, also include three Classic TT races so the Mountain Course will once again hear the V4 roar of the Honda RC30. The normal Manx GP classes such as the Senior, Junior, ‘Twin and of course the Classic Races that have formed the backbone of the Manx GP for many years will continue unchanged thankfully. 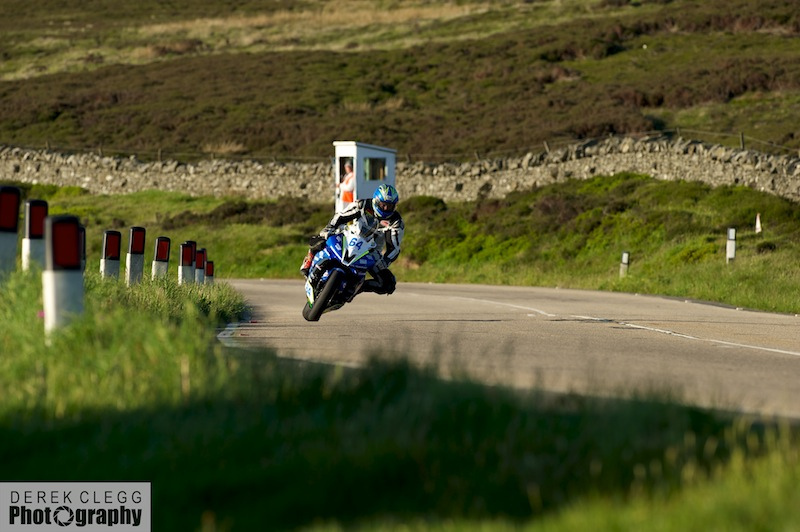 The Manx GP of course shares the same circuit as the TT races but a lot of fans enjoy the more laid back, chilled out nature of the Manx GP and adding the ‘new’ classes will, I am sure, bring even more fans flocking to the wee isle in the middle of the Irish Sea. Another meeting that also uses the Isle of Man as its base, but doesn’t use the Mountain Course, is the Southern 100, also known as the ‘Friendly Races’ due to their laid back nature. 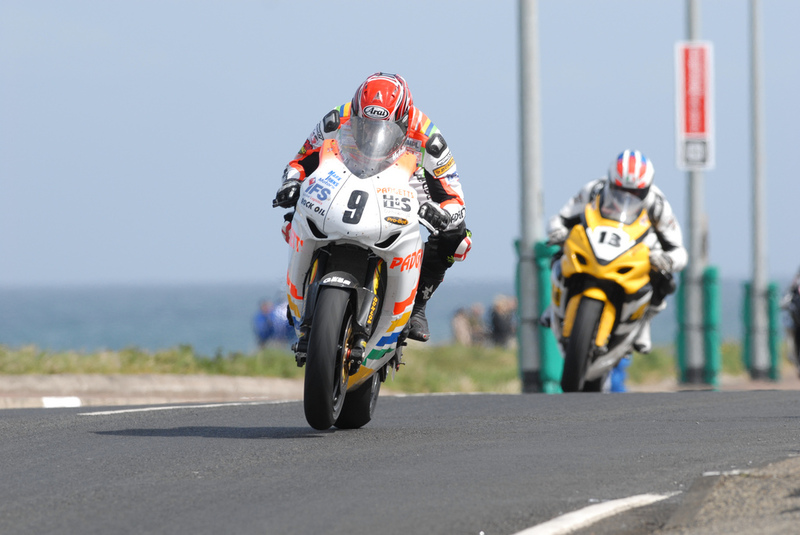 The Southern 100 races are held on the Billown Circuit near Castletown on the South of the island every July and attract all the big names including the Dunlop brothers, Guy Martin and Ryan Farquhar pre-retirement. The Cork Club held no road race in 2012, again due to financial constraints, but like the Kells and Athea Clubs, they are back on the calendar for 2013. Although the club held no ‘full’ road race in 2012, Cork did play host to a ‘Lightning Sprint’ through the streets of Dunmanway in West Cork which saw ex-GP rider Simon Crafar take part. 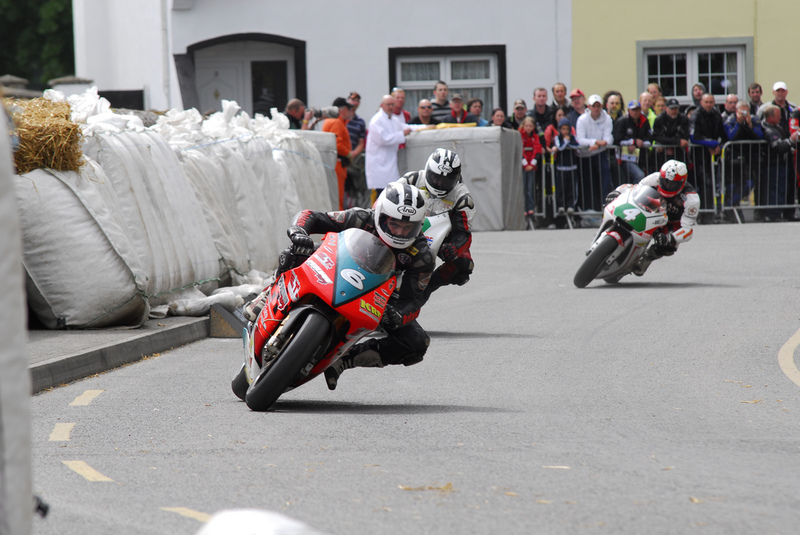 In 2010 the town of Dunmanway played host to the resurrected Munster 100 Races after an enforced sabbatical but for 2011 the club moved the races to Timoleague. The Club itself has actually split in to two clubs now and one club are planning to run the Munster 100 on an all new circuit in Glanmire in 2013. 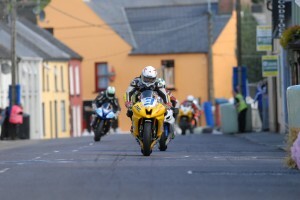 Dean Harrison leads David Yeomans and Alan Bonner through the narrow streets of Dunmanway. 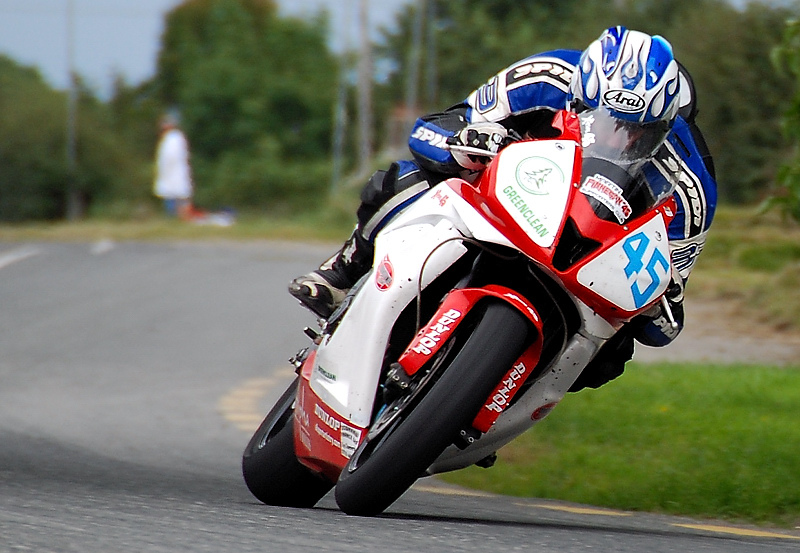 The Killalane Road Races are run by the Loughshinny Club who also run the Skerries 100 and both races share part of the main straight and the same paddock. The Killalane races bring down the curtain on the road racing season every year and as such tend to attract big crowds to the North County Dublin venue to see the various championships settled. The only circuit (to my knowledge) with a tree slap bang in the middle of it, it also has a cemetery on one of the corners to keep the riders focused on the job in hand! Viewing spots are excellent on the main straight and from the cemetery to ‘Schoolhouse Corner’ which leads on to the straight. If you have never been to a road race before, I can’t recommend the experience enough to you, there truly is no other sport quite like it in the world. I would also recommend you get along to one sooner rather than later, just in case the health and safety brigade bring the curtain down on one of the last great bastions of man and machine tested to the extreme. Here for your viewing pleasures are 20 pictures some of which are used in the post above, together with some bonus pics. All photos by Aidan Lynam except where stated. Enjoy!